As one of the first people to teach Chris Ware’s Building Stories (which just came out last month), I thought I would share what I’m planning. Given the loud and enthusiastic acclaim that has greeted Building Stories, I expect that others will also teach the work. (To the best of my knowledge, the only other person teaching Building Stories this term is Dave Ball.) 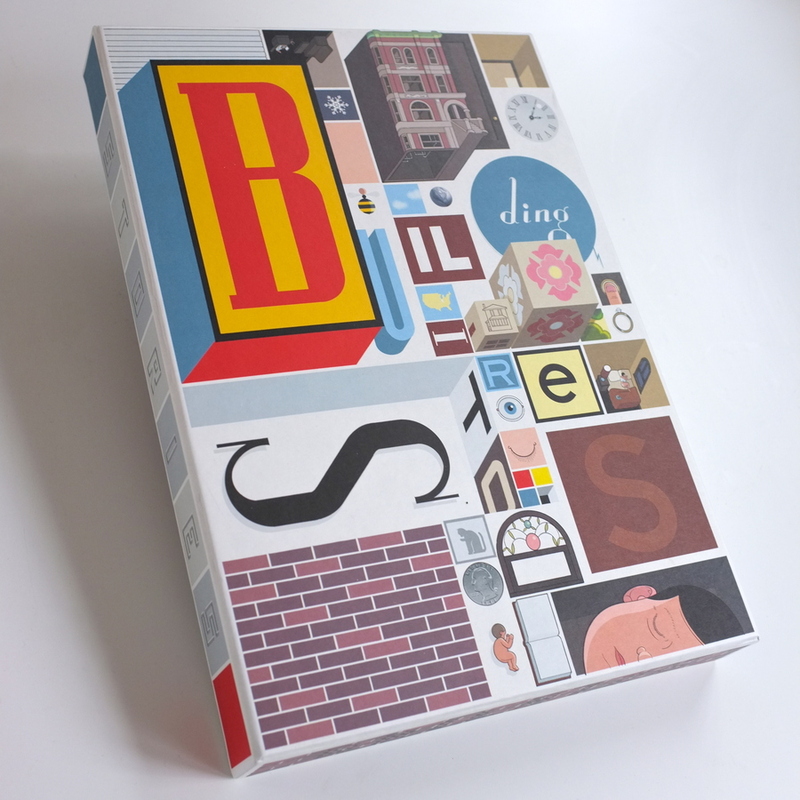 As serious readers of comics and graphic novels already know, Building Stories is a box containing fourteen textual objects — book, booklets, magazines, newspapers, Little-Golden-Book-designed book, small folded strips, board game, and the box itself (which resembles the box to a board game). As mentioned in class today (16 Oct.), I’ve divided up the readings for Chris Ware’s Building Stories — this is on the page I handed out in class, and the syllabus’s Schedule of Readings (scroll down). As I also mentioned, the book is the graphic novel event of the season. It made its debut about 2 weeks ago, and was the best-selling book on the New York Times‘ Graphic Books list this past Sunday (14 Oct.). In this post, I’m listing: (1) the questions (same as those handed out in class), (2) the list of readings, and (3) links to some of the many reviews, essays, and stories that have been published in the past few months. What stories does this part (or these parts) build? Provide at least three examples. What do we learn about our unnamed protagonist (the amputee)? In some cases, the connection will be more challenging to make. Pick three moments. Why tell this story in this form (book, newspaper, magazine, booklet, etc.)? What questions do you have? These can be discussion questions or simply subjects that perplex you. Each group (or pair) should address these questions, and bring them with you on your day. Bring an extra copy for me, so that I can follow along during discussion. Kevin Larimer, “The Color and the Shape of Memory: An Interview With Chris Ware,” Poets & Writers Nov.-Dec. 2012. Debbie Millman, “Chris Ware,” Design Matters, 19 Oct. 2012. 45-minute audio interview. Stephen Carlick, “Building stories with graphic novelist Chris Ware,” MacLean’s, 19 Oct. 2012. John Williams, “Book Review Podcast: Chris Ware’s ‘Building Stories,’” New York Times Book Review podcast, 19 Oct. 2012. Kat Ward, “Inside Chris Ware’s Graphic-Novel-in-a-Box,” Vulture, 7 Oct. 2012. Repr. from New York Magazine, 15 Oct. 2012. 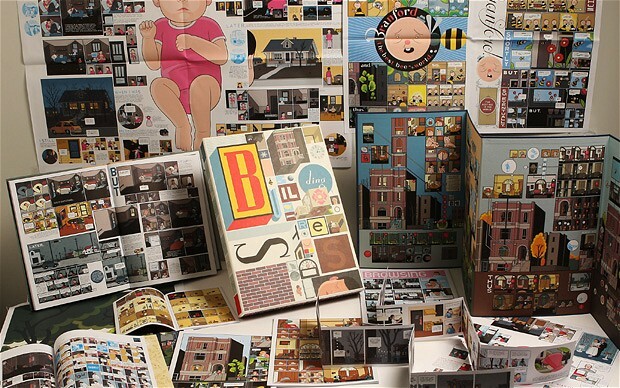 “Good Minds Suggest—Chris Ware’s Favorite Concept Books,” Good Reads, Oct. 2012. Isaac Cates, “The Diagram of a Life,” 31 Oct. 2012. Noel Murray And Tasha Robinson, “Delving into Chris Ware’s massive, multilayered comics project Building Stories,” The AV Club, 15 Oct. 2012. Rick Moody, “Fugue for Centrifuges: On Chris Ware’s ‘Building Stories,'” Los Angeles Review of Books, 25 Oct. 2012. Max Winter, “Building Stories — Chris Ware,” Full Stop, 22 Oct. 2012. Douglas Wolk, “Inside the Box: Chris Ware’s Building Stories,” New York Times Book Review, 18 Oct. 2012. Glen Weldon, “Bits Of Beauty Amidst The Gloom In ‘Building Stories'” NPR Books, 9 Oct. 2012. Cliff Froehlich, “Review: Ware’s ‘Building Stories’ is stunning success,” St. Louis Post-Dispatch, 2 Oct. 2012. Alex Hern, “Review: Building Stories,” New Statesman, 1 Oct. 2012. Pantheon’s page on Building Stories. The Chris Ware Building Stories Tumblr. The limited-edition model of the Building Stories building (from Drawn & Quarterly). Yes, you can actually build this. For the Ware completist, this model is currently, temporarily, in stock at Drawn & Quarterly. Since all 1000 copies are signed, it’s also rather expensive. That (the above) is what they have to get us started. At times, I wonder if I’m a little ambitious in assigning this dense, layered, beautiful, complex, experimental work to an undergraduate class on graphic novels. But, based on my experience with the class so far, I think they’ll rise to the challenge. In any case, teaching Ware is like teaching James Joyce or (in a children’s literature class) Lewis Carroll. The bright, thoughtful students tend to be intrigued, and embrace the experiment. Other students require more help in making sense of it. Teaching Ware is also like teaching Joyce or Carroll because Ware changes our understanding of what the medium can do. He writes strips that can (and must) be read in more than one direction, pages that need to be read multiple times, and books that make other cartoonists feel that they need to rethink their approach to comics. If you’re teaching a class in graphic novels or comics, you have to teach Ware. He pushes the medium further, and (I expect) will be pushing my students in the coming weeks. So. Here’s to the grand experiment! Image sources: Alan Trotter’s 5∞, Mark Hayes’ Passing Notes. Giving credit where it’s due: I found most of those links via Dave Ball’s Facebook page or his The Comics of Chris Ware: Drawing Is a Way of Thinking Facebook page. I don’t think I can teach this book because it’s too expensive. I don’t feel comfortable asking my students to pay $30 or more for a single book, especially if I’m assigning other books for the class. There’s also the practical problem of asking them to carry this giant heavy box to and from class every day, although it looks like you circumvented that problem by allowing them to bring only certain sections to each class. And I think these problems are not just trivial coincidences. I haven’t actually read Building Stories yet, but just by looking at it, I can tell that one of the important things about it is its sheer size. This is a book that’s designed to be huge and difficult and unwieldy and expensive, which I think would make it difficult (although potentially interesting) to teach. Now if I did teach Building Stories, I think I would not impose a specific order. I think it would be potentially productive if not all the students read the text in the same order. That way, they could talk about the way the reading order affects their experience of the book; they could share their insights as to how the story changes depending on what order you read it in. When I taught Garth Risk Hallberg’s A Field Guide to the North American Family, which is similarly designed to be read in any order, I asked the students to start from the first page and read to page 75, and I think that was a mistake. It limits the students’ ability to compare different reading experiences. I like your idea of asking specific students to become “experts” in specific parts of the book, though. I should have mentioned, above, that I asked the library to buy copies of Building Stories, so that I could put it on Reserves at the library. The library agreed to buy two copies of it — so, two are on Reserves. I have also encouraged my students (from the beginning of the term) to share — they might, I suggest, buy a full set of books between them. I recognize that any English class is going to be expensive. So, what tends to happen is that some students buy the books, some borrow (from library or another student). I take your point about not having them read it all in the same order. I agree. That would make for productive conversation about how reading order affects one’s experience. One question, though: Would you then require them to have read the entire box before the first day of discussion? If so, that’s a fairly large assignment. That’s an interesting idea, and it would be especially appropriate for Building Stories since it’s possible for multiple people to read it at once. I would not ask them all to read the entire book before the first day of discussion. Instead, I might ask them to read, say, 5 or 6 of the 14 components for each day. I think this would lead to interesting conversations because some of them would have read stuff the others hadn’t. That would mean that the students would not all be on the same page (both literally and metaphorically), but I think that in itself could be interesting. If I had a once-a-week class, then I could ask people to read it all at once, for the first day of discussion — especially if that class were an upper-level class. And, were that the class I’m teaching, I’d probably do that. But I do think we need to have all read what we’re talking about in class. It’s difficult to have a conversation about something you’ve not yet read. We’ll never be all “on the same page,” precisely, but we do need to have at least read the same pages. As someone who also teaches a college-level class on comics, I want to thank you for posting this. It’s a fantastic teaching design and a great set of resources for anyone who wants to engage more deeply into this challenging and important work. Kudos!